Dizzy Working Mom: Daycare Report Cards! I thought it would be fun to show ya'll Ben's report cards and then do a little comparison to Shelby's daycare report card. Yes, she gets those when she goes to daycare. Dogs are people too, ya'll! Sort of. This is the normal schedule that he has gotten into. Three six ounce bottles during the day at about three hours apart. He will have one 2.5 oz. jar of baby food for "lunch." He usually has a long nap in the morning before his first bottle. Sometimes he will have another longish nap, sometimes a couple of short ones in the afternoon. I nurse him once before bed. I like this schedule, but sometimes it is different. Ben is not a robot, and some days he is just less hungry, more hungry, less tired, more tired, having a hard time taking a nap, etc. I would say about once or twice a week, he also comes home in a different outfit because he has pooped on himself. Thems the breaks. Your eyes don't deceive you folks. Shelby is being described as "sweet, calm, friendly, and gentle with all." Now if you notice, they described Shelby as a "cavashon" in this report card, but I think that is just a mistake in her breed. I do think it is the right report card. There is another Shelby dog at daycare, but she isn't a cavashon. Shelby's report cards are normally like this - describing her as sweet and calm. One even said "laid back." So there are two possible explanations: (1) They are outright lying or (2) Shelbs is much better behaved at daycare. Now for a comparison between the two. Yes, I am actually going to do this! Ben's report card focuses more on the timing of his eating, pooping/peeing, and sleeping. This is necessary for a baby, because it helps you figure out why they are cranky/etc. when you get them home. You know if they should be hungry or sleeping or if they really need to poop. Obviously, I don't really need to know the exact times Shelbs did all of these things. It is just good to know that she was hungry for her treats and generally in good health. 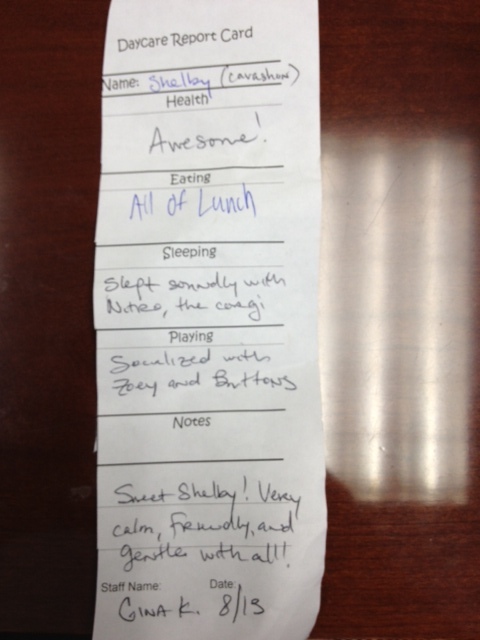 Shelby's report card focuses more on all of the awesome socialization that she had. She slept and played with other dogs! And I know the names of these dogs! Lots of times, if you see other owners waiting to pick up their dogs at doggy daycare, we might exchange names of our dogs to see if they are common playmates. Ben isn't exactly "playing" with other kids right now, although I can tell he likes to be around them. He likes watching other kids and squealing, etc. We will see as he gets older if his report card changes. Really, his is more for necessary information, and Shelby's is more for fun. I do think the caregivers at human daycare and doggy daycare probably expand on the good stuff more to make the parents feel happier. I am sure there are times where Shelbs moped a lot, but they don't put "Moped in the corner and whined!" on her report card. Same thing with Ben. Now, I do think that if Ben seemed overly cranky or something, they would tell me if they were concerned. But, all things being equal, they are going to tell me about when he was happy, not when he was covered in poop, crying, and gagged himself with a sock or something. To be honest, if he is healthy and happy when I pick him up, maybe it's better not knowing about the chaotic moment when he almost ate his own poop.